Time to shake up your holiday cookie roster? How about a batch of Austrian Husarenkrapferl cookies? This gorgeous almond shortbread, dusted with icing sugar and finished off with a dollop of jam, will be the talk of the dessert table. OK people the holidays, less than a month away! Have you started your preps, like for anything, yet? I have not except for a little cookie dabbling in the kitchen. This year I am serving up some Husarenkrapferl cookies and I am so very proud to include them in a Canadian Cookie Collaboration! I got invited to two separate events for holiday cookies and thankfully we managed to combine them into one. 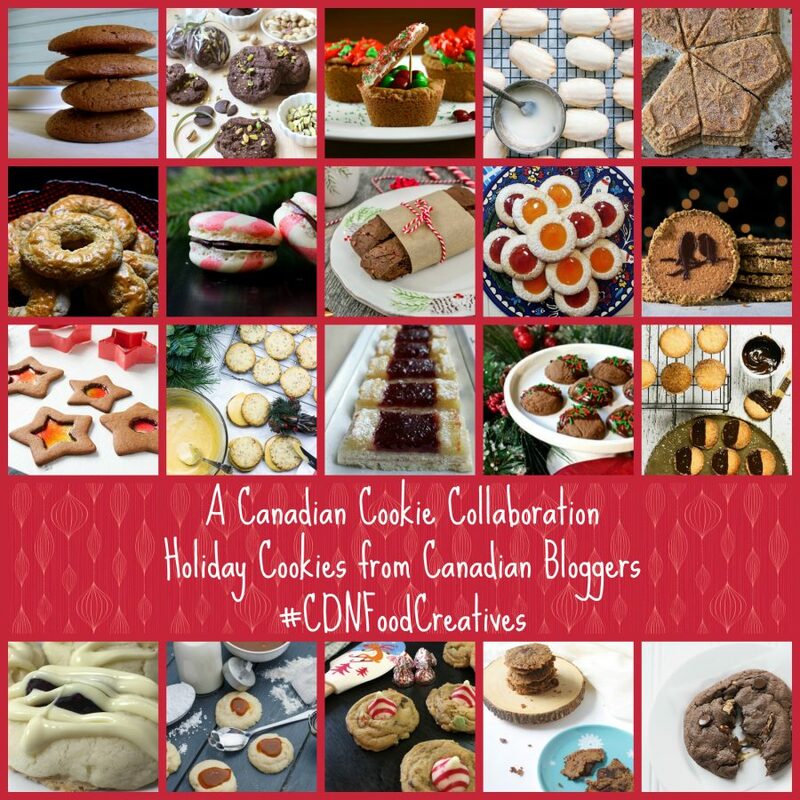 Thanks, Canadian Food Creatives and the Canadian Christmas Cookie Exchange for this fun event! And lucky you, there is an amazing round up of cookie links below to check out! Funny enough I posted another Austrian Christmas cookie last year called a Vanillekipferl. The two recipes are very similar, minus the jam and last year’s cookie is famous for its crescent shape. And I posted one more, a Linzer cookie. 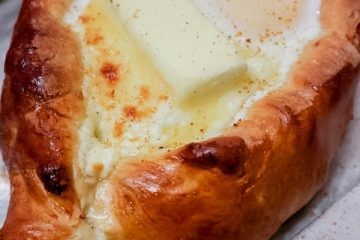 This Husarenkrapferl recipe comes from Her Ladyship Martha Starcey. Martha is originally from Innsbruck Austria, not far from famous Salzburg, and through crazy story she ended up re-inheriting an English title through marriage, and all this via Montreal, my city. What does a cavalry and a donut have in common? So what does Husarenkrapferl even mean? A vulgarized translation would be Cavalry Puff. The word Husaren means a branch of service of a light cavalry, originally a Hungarian term. The word Krapfen means donut. I can tell you that if a cavalry wanted to travel with these sweets, the jam would have to be on the inside and not on the outside like these cookies. So I am guessing this is a simplified recipe turned into a cookie. This is very much like your classic raspberry thumbprint cookie made with a shortbread dough but with the addition of almond flour (try hazelnut too), generously dusted with icing sugar and the imprint filled with a warm clear jam that cools to a gorgeous glistening dome. Can I tell you how fast these babies disappeared from my kitchen? In a large bowl, mix together the flour, icing sugar, vanilla sugar and ground almonds. Incorporate the egg yolks to the flour mix. Cube the butter into small pieces and cut the butter into the flour mix with two knives. Knead the dough for a bit and shape into a ball. You may need to add a little bit of liquid if the dough is too dry, such as milk or water. Flatten the ball of dough a bit and wrap it with aluminium foil or cling film. Refrigerate for at least 30 minutes so the dough can rest. 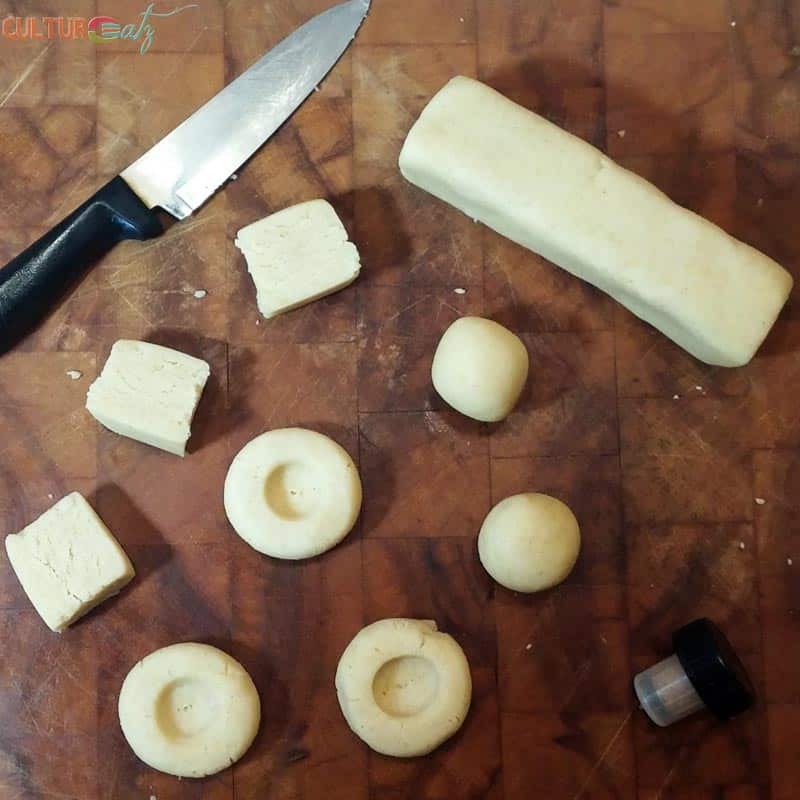 Roll out the dough into a cylinder, and cut it into 4 sections. Roll out each quarter into a cylinder, and cut it into 8 pieces. Roll these pieces into balls. Place the balls 2 inches apart on non-stick baking sheets. Lightly press the top of each ball and make an indent with your thumb or with the handle of a thick wooden spoon. Bake in a preheated oven at 350°F for about 11-15 minutes, until they are just starting to take a light golden colour. Do not overcook them, they will still be soft at this stage. Cool for 10 minutes on a wire rack and dust them with icing sugar. Heat the jam in a small saucepan or microwave until nearly boiling. 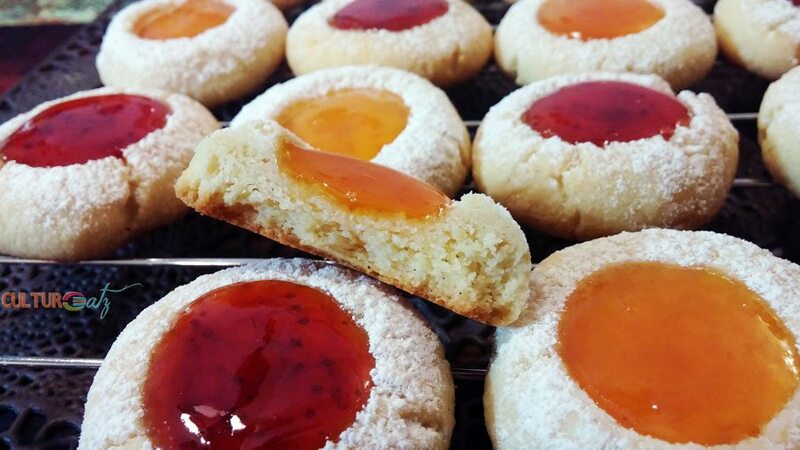 Carefully fill each cookie indent with jam using a teaspoon. Coolo cookies completely before serving. Welcome to this very special Canadian Cookie Collaboration between the Canadian Food Creatives (hosted by Laura) and the Canadian Christmas Cookie Exchange (created by Kacey). Evelyne, These cookies look melt-in-your-mouth fabulous!!! But don't ask me to pronounce their name! ? YES! almondy is totally a word ;-) so cool I hope you make them since you are all set Kirsty! What a pretty looking cookie! I don't really bake but I have a friend who does and maybe I should recommend that she does this. I really want to know how these cute cookies taste like. Thank you Marge! I hope you do get to taste these jewels :-) They are not hard to make if your friend says no lol. Such a pretty cookie! I couldn't resist having one. Or three. :-) Thanks! Or 6, I am not kidding ;-) Thanks John! Christmas Cookies are such a marvellous thing - especially in the cold climates like you guys enjoy. These, look super delicious & I can't wait to get back into the kitchen to make some of them. I love a good jam cookie! And these sound absolutely delicious. Thank you for sharing the recipe. I can't help admire the plate they are on! Thanks Rosemarie. I actually got this plate from monks in an abbey in Quebec but it is stamped Jerusalem Westbank! Thanks Ginig, I wish I could share...but I did eat them ALL lol. These look so perfect with the shiny jam in the middle. Would love one of these with a cup of coffee. Thanks Caroline, I a=have to say the jeweled jam did turn out well lol. It is that time of the year right? Lovely cookies for the best feast of the year! Yes sowly the festive season is coming upon us, ok not that slowly hi hi. Thanks Katerina. Beautiful little cookies! Thanks for the links to the collection! Hey Evelyne! These cookies look amazing! They look like little jewels! I love the rough translation as well! I can imagine the disappointment on the soldiers faces as they open up the container and see the jam had spread everywhere. So sad. These look amazing! LOL yeah the name is a tongue twister. Thank you so much! This reminds me of dewberry cookies, we love them. 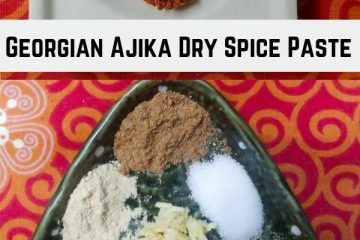 Now I think we can make them at home thanks for you recipe. Thanks Raymund and I will have to look up dewberry cookies. These are gorgeous thumbprints! Love the jewel toned jams---just beautiful! Thank you Liz, they WERE is the operative word though lol. Thanks Diana and yes jam and cookies...heaven. I would say the balls 1.5 in in diameter if that helps. I took up canning a number of years ago and rapidly realized that I make more jam than I can possibly eat. So these cookies not only look AMAZING, they look like a really good excuse for me to use up some preserves. That way when I eat 12 of them in one sitting, I can tell myself that it's because I'm being frugal and efficient (right?). My pleasure Lorraine hope you make them! These look so delicious Evelyne!! 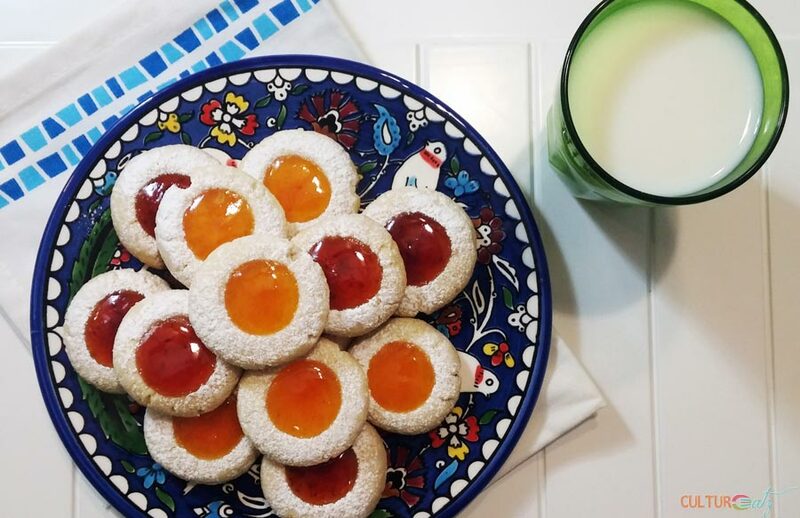 My mom used to add jam to her sugar cookies and I miss the fruity taste. Maybe I'll have to get her to make your cookies this year - the almond flour sounds like the perfect twist to a shortbread cookie too! I love the name of these cookies! It must be satisfying to say. They're beautiful, too so perfectly shaped and jewel-like. LOL Thanks Teresa and yes just as satisfying to eat as the are to say. This cookie exchange has been fantastic because I am being introduced to new cookie recipes (and history!) They look delicious! Thanks for all your hard work! Thanks so much Kacey for your great idea and this great collaboration. I am in love with all the cookies! Seriously stunning cookies Evelyne! The jam in particular really caught my attention. I'd like to bath in it as well as eat it! Thanks so much Samantha! Oh a bath is a great idea! That jam is glistening off the screen. I hope to get some cookies baked for Christmas this year. Thanks so much Tandy, and I am sure you will bake plenty before then! Oh you know these are a winner when there are almonds in the cookie dough! So cute:) I also fell in love with apricot jam when I was in Paris, it is so delicious, isn't it? Thanks so much Amanda. And yes loved the almond flavor here and apricots. Apricots are huge in Austris so makes it extra traditional. Thanks Maria :-) And yeah I at least got a gift wish list and out, planning on online shopping this weekend lol. 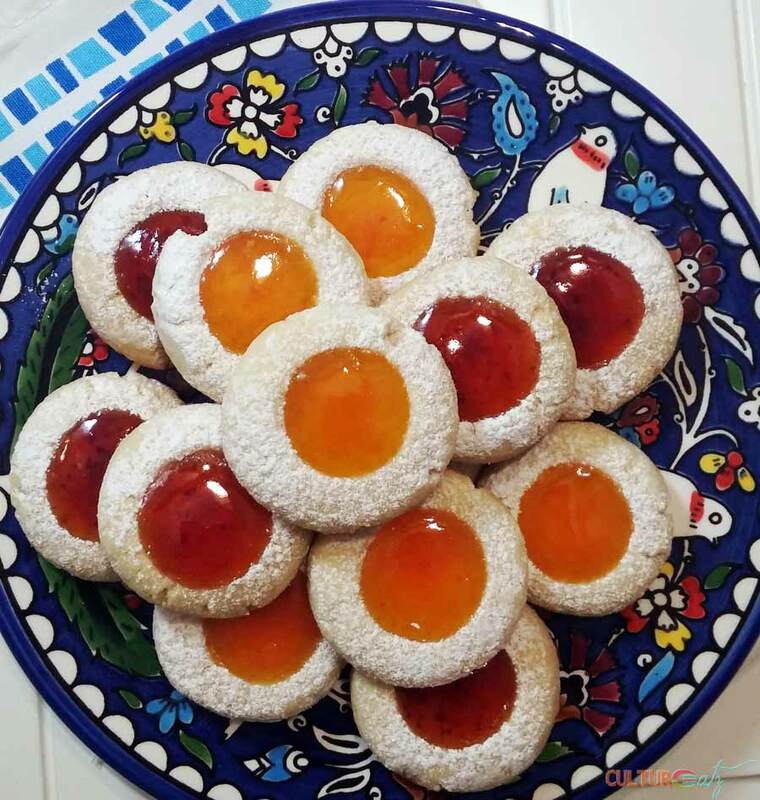 I love shortbread cookies with jam, these look delicious! What a great round-up we had! Ooooooh these look so good! I love cookies with ground almonds as a main ingredient, and with a jam centre...delicious! Thank you so much Jo-Anna! yeah the almonds make all the difference. Sometimes hazelnuts are used, must be good. wow I am impressed. These X'mas cookies look just the one I saw in lour local bakery the other day..excellent job, Evelyne. Thank you Pam, oh would love to see yours are they on your blog?